The High Tea Inspectors: The Observatory Hotel, Sydney, N.S.W. The Observatory Hotel, Sydney, N.S.W. For something a little different, have your tea leaves read! After visiting most shops at The Rocks, we arrived early in desperate need to sit back and relax with our favourite pastime, partaking in afternoon tea. I had previously made reservations for the "Mystic Afternoon Tea" and the friendly staff made us very welcome. We were offered a wonderful and generous array of sandwiches, pastries, scones with jam and cream as well as lovely tea cakes all with a excellent selection of teas. My selection was darjeeling as I hoped to get some lovely tea leaves for my reading. I found the 20 minute tea reading with Lindel most enlightening and I thoroughly enjoyed the experience. We had fun comparing our readings. Part of mine was a strong desire to speak out and express myself and the letter T. At the time I had no idea what it all meant, later it dawned on me, ha! my tea blog. 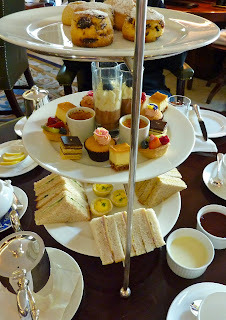 The tea service was well patronized and everyone appeared to be relishing the very fine surrounds and the Observatory afternoon tea. This is an outstanding idea to combine the best of refreshments and a tea leaf reading by a very intuitive and professional reader. I do recommend that if you want something special, try the Mystic Afternoon Tea at The Observatory. The Tea Room, QVB, Sydney, N.S.W.